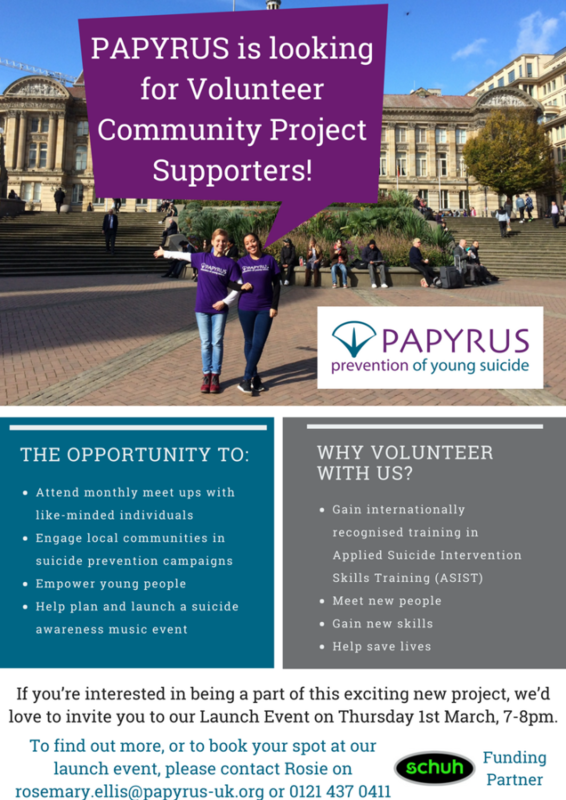 Please see the invitation below from PAPYRUS to join their West Midlands Forum, a group of volunteers who work together to organise suicide prevention campaigns, events and activities in their communities. The Forum has some very exciting work brewing for the next 18 months of the project and needs new members! To find out more about this exciting new PAPYRUS project, please go to the launch event on Thursday 1st March at 7pm at SWITCH, 1 Castle Street, Dudley, DY1 1LA. To sign up to attend the launch, please complete this Google Form. Please see the flyer below for more information, and please also share this invitation as widely as you feel appropriate – all welcome!